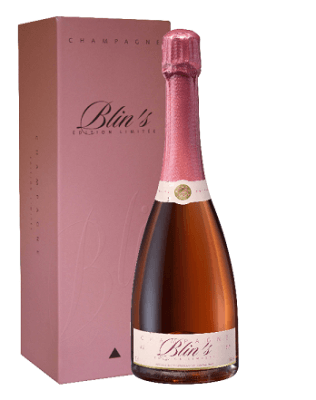 Blin rose Champagne Edition Limitee packed in a gift box, pale Rose, generous mousse, ripe jammy strawberry fruit on the nose, balanced palate with good acid structure and tasty complexity. Champagne H Blin Rose Limited Edition. Deep gold pink, scattered with thousand fine bubbles. Shows power and strength link with softness and lightness: notes of fresh red fruits (raspberry, strawberry) with some overtone of dried fruits (almond) and soft spicy cinnamon and vanilla, subtle print brought by the red wine. The predominantly chardonnay is confirmed in the finesse and accuracy of the aromas. THE MOUTH, spicy and fruity notes mix with deeper aromas giving a vinous and structured character to mouth is emphasized by an impression of softness and strength in a dynamic of freshness and liveliness.The texture marries into smooth dense velvet. general impression remains a great delicacy of lightness and structure.